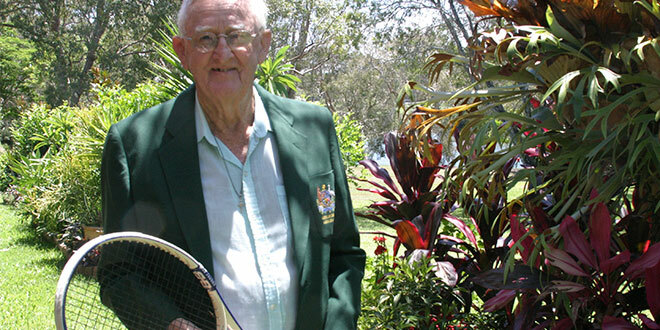 Life of tennis: Brian Hudson wearing the Tennis Australia blazer he was awarded as a national representative at a veterans’ tournament in Argentina in 1989. LIFE-long professional tennis coach Brian Hudson, now 84, casts his eye over the list of players at the Australian Open 2018 and there’s one who stands out as someone he’d love to take under his wing. Brian has coached thousands of players of all standards over decades, helping several to the top of the tree, so he knows what it takes to be a champion. When asked which player from this year’s Open he’d most like to coach, he has a cheeky smile. “I know who I’d love to coach, but I don’t think he’d let me … Kyrgios,” Brian said. Nick Kyrgios is the 22-year-old Australian player ranked number 17 in the world who has been a controversial figure for his on-court behaviour and attitude. Until the recent Brisbane International tournament, which he won, Kyrgios, unlike most other players on tour, did not have a coach. Brian is in agreement with champion Roger Federer’s assessment of the young rising star. “Roger Federer (has as much has) said (Kyrgios is going to make it to the top) one of these days, when he learns to control his temper and his manners and so forth on the court,” the retired coach said. Manners matter to Brian, who lives in retirement with his wife Beryl on the Gold Coast where they are parishioners at Calvary Church, Miami, in the Burleigh Heads parish. And fine manners is what one of Brian’s star pupils, Helen Gourlay, still shows him by keeping in touch and sending him a Christmas card every year. She achieved her highest world ranking as a singles player in 1971 when she climbed to number 12, but she starred on the doubles court, winning 20 career titles on the world circuit. She was once ranked number-one doubles player in the world. The pinnacle was winning the women’s doubles title at Wimbledon in 1977, teaming with American JoAnne Russell to beat Martina Navratilova and Betty Stove. Brian takes pride that he helped Gourlay develop the volleying skills that proved so decisive for her in doubles. He loves the game, has fond memories of being competitive with champions such as Lew Hoad, Ken Rosewall and Tony Roche in his younger days, and still enjoys having a hit. “My coaching history is better than my playing career,” he said. His promising career as a player stalled when he was enlisted for National Service as he was just hitting his straps. “I got robbed by the government,” he said. “I’d just won the NSW under-19 singles championship at eighteen and seventeen, and I was in the two finals at fifteen and sixteen, beaten by John O’Brien. “He was two years older than me. “At eighteen was when they drew you out for National Service. It ruined my tennis career. “Because, at 18, I was playing Lew Hoad and Ken Roswell, and I had a match point on Hoad once, I had a match point on Ken Rosewall once, and I held a match point on Roy Emerson once – three players that won more championships than any other Australian. “That was at 18, and I was at the peak of my tennis at that stage. I’d won major championships all over the place – not Grand Slam stuff. Brian can have a chuckle about it now because he can cherish the memories, and he’s had a wonderful life since then with his wife Beryl, their seven children, 33 grandchildren, 15 great-grandchildren and four great-great-grandchildren – with two great-great-grandchildren on the way. And he continued to win titles wherever he went, even into veterans’ tournaments which led to him representing Australia in Argentina in 1989. Brian and Beryl tied the knot at a Catholic church in Sydney – he was 21 and she was 18 – and they’ve been married for 62 years. One of Brian’s special wins soon after they were married was a life-changer for them – but it wasn’t on the tennis court. He had been using another talent – singing – as a money earner. “From the age of nineteen, when I sang at my first wedding, until I was thirty-six, I’d sung at a total of 5000 professional engagements,” he said. “It was mainly weddings, because I had this ad in The Catholic Weekly in Sydney for twenty-two years non-stop. That went to another level when he won a singing competition on a popular Sydney radio show. “I won the Gladys Moncrieff on Radio 2GB,” he said. “I sang the Song of Songs to win it. “She was our greatest soprano of the time, touring the world and everything, and her radio show was big. “I was 21, and she called me ‘the tenor with the golden voice’ on the radio show. One of those calls was from then NSW Premier Joe Cahill who had heard Brian on the Gladys Moncrieff Show and wanted him to sing at a family wedding. He was coaching tennis during the day, and singing professionally at night and weekends at clubs and public functions as well as weddings. Brian said by the time Beryl was 26, they had six children, “and it was the singing that kept us financial”. “Today, I give my voice to God ­ because he’s been so good, oh, so good to us,” he said. Brian stopped singing professionally eight years ago. “I sang at my last wedding up here at Miami,” he said. “They were elderly – he was about seventy-five, and he’d lost his wife, and the lady he was marrying she went to our church, and she had lost her first husband. “She said she only wanted me to sing one song, I’ll Walk With God, and I said, ‘That’s easy if that’s all you want’. The widow told Brian the funeral was being held in the same church as her recent wedding and she wanted him to sing the same song. It was daunting, but he agreed to her request. “So I had six months prior stood up at the same spot in the church and then six months later I’m standing up there two metres from this man’s coffin singing I’ll Walk With God. “That is the hardest thing I’ve ever done in my singing career – the only thing that I’ve done remotely like that. “Other things hadn’t perturbed me at all, but that did. “That affected me, still does. I get emotional thinking about it. “That was the last wedding that I ever wanted to sing at. “From then on I dedicated my voice to God, for what he gave me, and my voice is still holding, amazingly, pretty well.